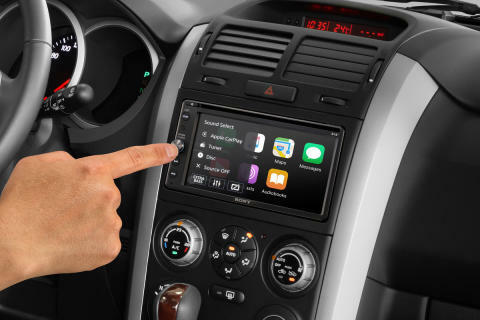 Easy smartphone integration with Apple CarPlay* to manage communications, get direction, and control over music on your phone, all hands-free. This new XAV-AX205DB car audio receiver from Sony will keep you listening clearly to your favourite radio stations for years to come. 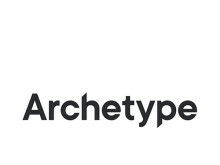 With a built-in DAB/DAB+ tuner it will make sure you are ready for broadcast changes ahead. 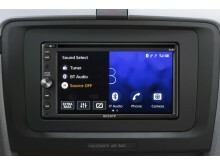 The AX205DB is Sony’s first visual receiver model with Apple CarPlay as well as DAB. Building upon the recent success of the XAV-AX200 model, Sony introduces the new AX205DB to provide all the original convenient features alongside several new additions to make for an enjoyable and stress-free driving experience. The great smartphone connectivity, sound quality and usability come in this unit, together with 3-camera input. So you can select additional two camera views manually while rear view relates to the reverse gear, which is particularly useful for those tight and testing parking spaces. DVD player with video out and high voltage pre-out features are also useful new additions when expanding your system. 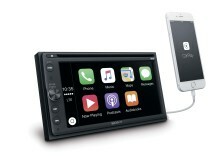 The AX205DB boasts excellent smartphone integration for in-car usage with Apple CarPlay built in which allows you to connect your smartphone and safely use apps and drive simultaneously. 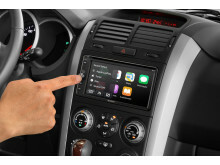 Apple CarPlay seamlessly integrates your iPhone with the car audio’s display and controls meaning you can make phone calls, access your music, get directions etc. while you stay focused on the road. In addition to 4x55W highest industry output power, this AV receiver features the EXTRA BASS™*** circuitry which overcomes engine noise and reproduces clear punch sound at any volume level. The 2-mode boost steps allow you to get delicate and heavy boost settings, depending on your mood. You can also benefit from the sound optimization as the DSO (Dynamic Stage Organizer) creates a more vivid sound as if there were speakers in front of you. The 10-band equalizer (EQ10) with 10 presets provides easy and effective frequency adjustment for various listening environments. 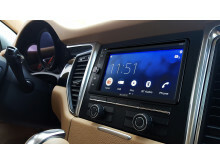 Compared to the conventional double-DIN receiver units, its slimmer back chassis with external space underneath enables easier cable management when installing. The XAV-AX205DB model will be priced at approximately 7.500,00 SEK and available from May 2018, across Europe.